Having repeatedly referenced this article in published reviews, I am continually surprised that: 1) no one seems to cite this 1976 article and 2) few seem to remember that the “symptoms of autism” are the “same” as the symptoms of low-dose organic-mercury poisoning by Thimerosal-preserved vaccines that are still in use in the USA (mainly in the influenza vaccines given to pregnant and lactating women and developing children after 2002 as well as today to all adults annually) and other countries that still use Thimerosal-containing vaccines in their routine early childhood vaccination programs. “The report was co-authored by HRSA and data collection was conducted by the CDC. The data come from the National Survey of Children’s Health, a nationally representative phone survey of households with children. This survey is conducted every four years. •	The prevalence of parent-reported ASD among children aged 6-17 years was 2 percent [1 in 50] in 2011-2012 compared to 1.2 percent [1 in 83] in 2007. •	The change in prevalence estimates was greatest for boys and for adolescents aged 14 to 17 years. •	Children who were first diagnosed in or after 2008 were more likely to have milder ASD than those diagnosed in or before 2007. •	Much of the increase in the prevalence estimates from 2007 to 2011-2012 for school-aged children was the result of diagnoses of children with previously unrecognized ASD. The second bullet point is especially telling and may indicate that, under today’s vaccination schedule, the development of sufficient symptoms for an “autism” diagnosis may be taking longer than it did in the mid-2000s. 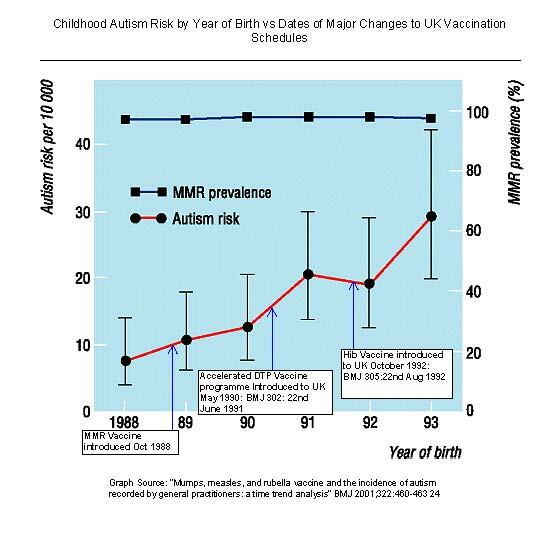 Hopefully, some of the preceding information will stop people from focusing on the MMR vaccine because, based on the significantly lower “autism” rate from the data reported in a 2010 study looking at autism and jaundice (1 in 1272), it would seem that the MMMR vaccine in a Danish vaccination program that recommends a much lower number of vaccines and requires them to be free of Thimerosal (one trade name for an organic mercury compound, sodium ethylmercurithiosalicylate, that is 49.55% mercury by weight), is a direct causal factor in “5%” of the 1 in 50 cases in the USA. Finally, while autism is a serious chronic childhood medical condition, the focus should be on all the epidemics of chronic childhood medical conditions that, in the 2006 NHANES report, reported that 50% of all children had at least one chronic medical condition and predicted that more than 25% of the USA’s children would have at least one lifetime chronic medical condition, which include, but are not limited to, “autism”, ADHD, asthma/COPD, diabetes, dilated idiopathic cardiomyopathy, encephalitis and encephalopathy, epilepsy, gastrointestinal diseases and disorders, Guillian Barré syndrome, multiple sclerosis, chronic skin conditions, obesity, and vasculitis. Dr. Andrew J. Wakefield has a good discussion on the history of the association of the live viruses known to cause brain inflammation with autism spectrum disorders in his book, “Callous Disregard, Autism and Vaccines – the Truth Behind a Tragedy,” Ch. 9, “The Devil’s in the Details.” I was just reading it yesterday. Apparently Bill hasn’t been paying attention lately and puts forth that measles can be deadly but not so with autism. There have been hundreds of deaths of autistic children across the U.S. in the last decade. Deaths from seizures, wandering and drowning or being struck by vehicles, or the worst of all…..the victims of homocide by caretakers tipped over the edge of sanity by the overwhelming crisis of autism in their family. All a direct result of their autism, all would not have happened had they not been autistic. So the trade-off is not life vs autism at all. Let’s see if we go by the number 1 in 40,000 deaths from measles what do we get. One very tragic and unfortunate death, never a good thing. But we get 39,999 children with lifelong immunity to measles. The girls among them now can pass on immunity to their newborn through the placenta and breast milk, therefore reducing the new and previously unknown risk of “infants” being at risk of these diseases when they are most dangerous. Or let’s vaccinate the same 40,000 and what do we get. 800 Children with Autism, another 800 with asthma, 600 with life-threatening peanut allergies (because peanut oil is used in vaccines because it is cheaper than other oils and is caught up in the inflammatory response that is designed to happen), 1200 children with a developmental disorder of some kind, 8 children will be diagnosed with a childhood cancer (another rapidly increasing problem no one seems to be able to explain), a significant number with Crohn’s disease, colitis, Celiac, and other gastrointestinal disorders that have tripled in the last two decades and of course the significant statistic that I.Q.s have dropped an average of 10 points in the last 20 years. Those 800 children with Autism…..on average 744 of them will never live independently, go to college, join the military, or hold down regular jobs. They will require care 24/7 for the rest of their lives. Measles is short lived and conveys immunity for life. Autism is just for life. When talking trade-offs or comparing benefits vs. risks there are many factors that can be evaluated, mortality, morality, quality of life, quantity of life, short term inconvenience, long term outcomes, economic impacts, and more. If you compare measles to autism, well there just is no comparison, autism is 1,000 fold more devastating to human life than measles ever was or could be. People like Bill assume that vaccines are protecting the health of our children while it becomes more apparent that it is destroying health. While they may not have the measles, we have the sickest generation of children in the history of the world and many of these immune system disorders are tripling in a very short time and they last for a lifetime, heavily impacting not just the quality of life but quantity as well, since diabetes and other diseases will significantly shorten life. In fact many experts believe we are seeing the first generation of American children that will not outlive the life expectancy of their parents. A very sad state of affairs. If you are going to promote vaccination as the savior of our children’s health then you better be able to show me children that actually have health or healthy outcomes and we are certainly not seeing that. And we haven’t even touched the economic impact of generations of chronically ill and disabled children that at 21 will be signing up in record numbers for Medicare and Social Security without ever having put into the system. We are headed for a tsunami like disaster of epic proportions. Bill might want to rethink whether nursing your kid through a short bout of the measles might not be preferable to a lifetime of misery and despair. Bill argues that autism is a worthwhile outcome of the measles vaccine and preferable to dying from the measles. He might argue he does not say this? But measles for the English has long been recognised as mild and good for our developing immune system. Personally it would be good to have a measles vaccine that is safe and stops us getting this dangerous illness. The issue is complex and here is one article that sparked my interest many many years ago so is dated but has lots and lots and lots of good sense that has stood the test of time. Problems from vaccines have been known ever since the first ones 200 years ago and before MMR comes DTP and before DTP comes Hep B. Hence the risks accumulate as we get more and more vaccines. My first vaccine was at 5 to 6 YEARS of age and not the one DAY current in many countries. Hence to me turning a valuable health benefit into a lottery for the next born children and their health. Although I do agree that we still do not know what causes autism, I disagree with your conclusion that all studies claiming that MMR is unrelated to the development of autism are invalid. Would you mind reading my blog at http:// dev. isucomm. iastate. edu/thegreenroom/derekaj/2013/12/02/does-vaccination-your-child-increase-their-chance-of-developing-autism/? I would like to have your perspective. [ED: The poster is apparently a freshman in engineering who is suddenly an expert on autism with the first trimester barely over. I don’t mean to be confrontational, but I never claimed to be an expert. I do, however, have research articles at my disposal that others may not have access to due to my enrollment at a university of science and technology. I also feel it is important to mention that I have loved ones who are affected by Autism. So, although my course of study is engineering, my interest in researching the subject comes from a personal interest not a professional one. I am still interested in hearing your perspective of my research regardless of my level of education. I am also curious what your educational background is so that I can further understand your perspective. Does anyone really think that the CDC would ever put out a valid study that would show a connection between vaccines and autism?! If they ever put out a study saying there was a connection, vaccine rates would plummet, and that is the last thing they want. Also, Big Pharma is in the back pocket of our government, and the CDC obviously is a governmental agency. They would NEVER put out a study that would hurt Big Pharma, or that would clog our court system. If you want a study done to prove or disprove something, it can be done. You can play around with stats and make your case. I have to laugh whenever I hear that the CDC denies a link. Our government is all about corruption…IRS, VA, and CDC.